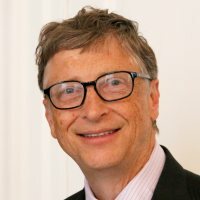 American business magnate, philanthropist, investor, computer programmer, and inventor. In 1975, co-founded Microsoft, the world’s largest PC software company, with Paul Allen. During his career at Microsoft, Gates held the positions of chairman, CEO and chief software architect, and was the largest individual shareholder until May 2014. Gates has authored and co-authored several books.